Cut bread into 1/2-inch pieces. Bake for 30 minutes, turning over once. If bread is not completely dry return to oven, checking until completely dry. Do not brown the bread, just dry it. Let cool and spin in food processor until you have fine crumbs. Use plain or add your favorite dry spices while spinning. Keep refrigerated or freeze for extended period. 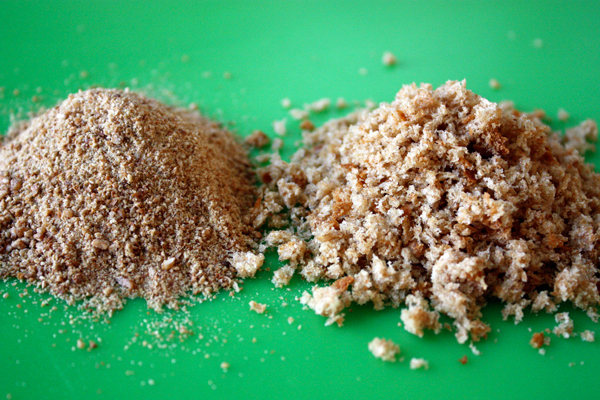 Note: To make fresh bread crumbs, cut or tear the same fresh bread into pieces and pulse in food processor to the crumb size you like, about 20-30 seconds. If you dry those pieces in the 300° oven for 6 to 8 minutes... you'll have Panko! 6 Comments on "Homemade Bread Crumbs"
Love this recipe. Will never buy expensive bread crumbs again. Preheat oven to 325°. Spray or lightly butter two 8-inch round cake pans and flour very lightly. Line the inside bottom of the pans with parchment paper. Cake comes away from the pan walls slightly when it’s done. Beat the 2 egg yolks until light in color. Beat in the almond extract and slowly add the sugar continuing to beat until well blended. 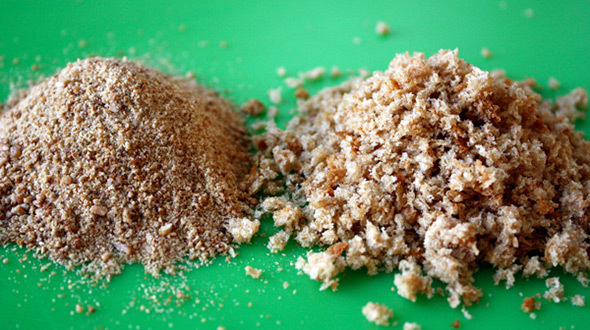 Stir in the walnuts, bread crumbs, baking powder, and vanilla, mixing well. Beat the remaining five egg whites until foamy. Add the pinch of salt, and continue to beat until stiff. Gently stir in a third of the whites into the batter then carefully fold in the remaining whites. Spread the mixture into the prepared pans and bake 35-45 minutes. Cool cake in pans 5-10 minutes before turning out onto racks. When the torte is completely cooled I spread Jenny’s, your, vanilla custard between the layers and pipe some of it in rosette shapes on top. OMG! Yum! Wow, this sounds really good!! A must try! 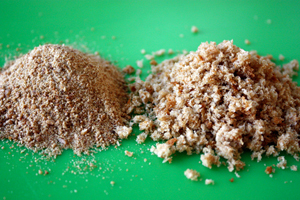 Thanks for the recipe and video for making bread crumbs. I will be making bread crumbs soon.